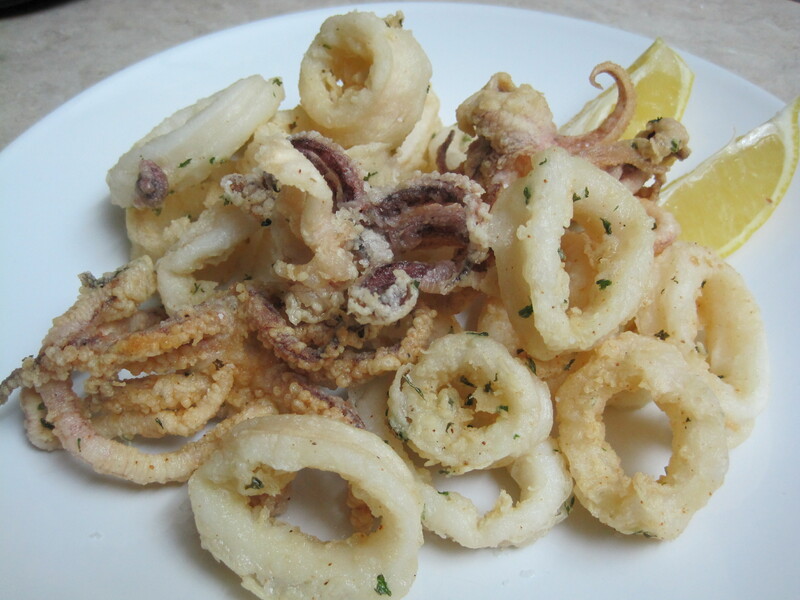 Every restaurant uses a different coating or batter for deep fried calamari. Personally, I prefer calamari that is crispy, but very lightly coated so that you can enjoy the subtle taste of the squid. I’ve made this several times now and it always works – as long as you watch the temperature of the oil carefully (see the note below for details). Photo above: Half of what the recipe makes is shown above. Note: It is important to watch the temperature of the oil carefully. When the oil is initially heating up, don’t allow it to burn and be patient, because if you cook your calamari at under 350 degrees F, it will taste greasy. The temperature of the oil will drop slightly when you add uncooked pieces of calamari, so cook them in batches. Also, allow the oil to return to 355 F before adding the next batch. Heat the oil over medium heat in a wok or in a large, wide mouthed, heavy bottomed pot. The depth of the oil should be more than enough to cover the calamari pieces, approximately 3 inches deep. Heat the oil to 355 degrees F (I set up a candy thermometer). Meanwhile, mix the flour, parsley, salt, a pinch of black pepper, and garlic powder (if using) in a wide mouthed bowl. Just before you’re ready to cook the calamari, work in small batches and toss the calamari pieces into the flour mixture and coat them very well. Gently shake off the excess flour and carefully add the calamari pieces to the hot oil. Fry until crispy and pale golden, about 2 minutes. Do not overcook or the calamari will be tough. Fry the calamari in 2 or 3 batches and do not overcrowd the oil. Ensure that the temperature of the oil returns to 355 F between batches. Using a Chinese wire strainer (or a slotted spoon), transfer the fried calamari to a paper bag lined plate. (Note: I’ve always found that using paper towel makes deep fried foods soggy, so I prefer to use brown paper bags.) Sprinkle immediately with coarse salt. Try not to stack the fried calamari pieces. Transfer the fried calamari to a clean plate, add the lemon wedges, and serve immediately while still hot with the dipping sauce(s) of your choice. No way?! That’s great to know! 🙂 Thanks so much! Look delicious! I will try to cook it. Thank you for your comment! I hope it works well for you! Thank you for another great article. Where else could anyone get that kind of info in such a perfect way of writing? I’ve a presentation next week, and I’m on the look for such information.